The goals of the first level study program are to train students for various areas of work of lower and middle management in economic and other companies. The study process is organized in such a way as to motivate students who have successfully completed secondary education, as well as those who have failed to complete higher education. Students acquire basic interdisciplinary knowledge of corporate law and management in entrepreneurship. Graduates master the tasks in managing modern information-based business functions of small and medium-sized enterprises: purchasing, production, sales, staffing regrading planners and analysts. Graduates may work as small lawyers in companies (preparation of internal documents) or work as lawyers and notaries. Number of enrollment places: The Faculty enrolls 50 students in each year of study. part-time study: part-time study: the program will be conducted in full range of lectures and shortened seminars, exercises and practical training. AQUIRED TITLE: "BACHELOR OF BUSINESS LAW"
The application for enrollment is submitted via an electronic application on the web portal eVŠ http://portal.evs.gov.si/prijava/. Candidates will receive invitations for enrollment by mail or by e-mail based on the submitted application form. Enrollment is only possible for those who have previously submitted an electronic application form. You can fill in the electronic application form at the headquarters of our faculty. In the higher professional study program Management and Law, a person who has obtained a foreign education comparable to a general matura, vocational matura or final examination under any program for obtaining a secondary professional education may also be enrolled. Applicants applying for enrollment with education acquired abroad, together with the application for enrollment, also apply for recognition of education for the purpose of continuing education with the required evidence. The requirement for enrollment of foreign citizens is shown in English, at least at B2 level. Applicants obtain detailed information on the recognition process from an authorized person for recognition procedures for foreign education, from: Natja Lavrič, univ. grad. law., phone no. 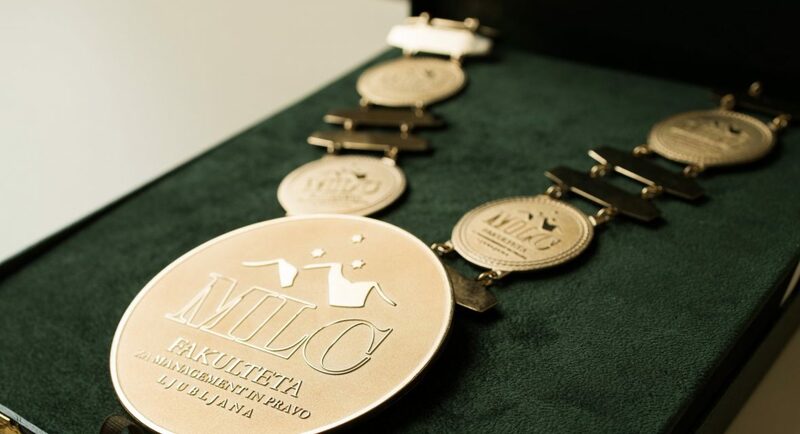 : 040 931 231 or (0)59 047 920 or info@mlcljubljana.com. In the study program, both basic program disciplines, management and law, enriched by the digitization of business, are balanced. It is also important that almost one fifth of the student’s workload is devoted to the field of practice. Practice, supported by the subject Professional Development, is a deliberate program of acquiring competences and skills, especially important for optimizing the employment opportunities of graduates. (3) practice in partner companies and institutions. content and form of the work of managers and professional services of companies in the private or public sector, professional services of law firms, notaries and state administrations. Observational practice is carried out in stages: observation (detection and recording of contents), recognition (knowledge of performance and typical characteristics), improvements (improvements in the implementation of management functions). Implementation of observation practice: excursions, guest lecturers, case studies (written), practitioners. Laboratory practice means learning about the implementation of management functions in a virtual environment, with e-support of business functions in a way that is implemented in business systems that use extended computing applications. For this purpose, the software of the world-renowned German computer company SAP is used, which is used by us in over 120 (mainly major) business systems. Successful students obtain a certificate of basic training for SAP issued by SAP Slovenia and MLC Ljubljana. In addition to the “MLC Diploma”, the document means information on the knowledge and additional competencies of the graduate to the employer. Practice in a company is practical training for jobs that are suitable for the educational level of graduates of this study program. The practice in the company is usually carried out in those companies, with which the faculty concludes appropriate written agreements. The practice is properly defined and organized in agreement with the company. Practical training may be related to graduation work. 570 EUR (enrollment fee is charged only when enrolled in the first year of study). It is possible to pay up to 48 monthly installments, the amount of the installment depends on (partner) discounts and other benefits. Students who do not enroll in the program and undertake any of the study activities, are charged at ECTS; the price per individual ECTS is 97,00 EUR for part-time study and 75,00 EUR for part-time study. Meetings with well-known experts from practice when carrying out courses or specially organized lectures. Practical training for work with online advertising tools. 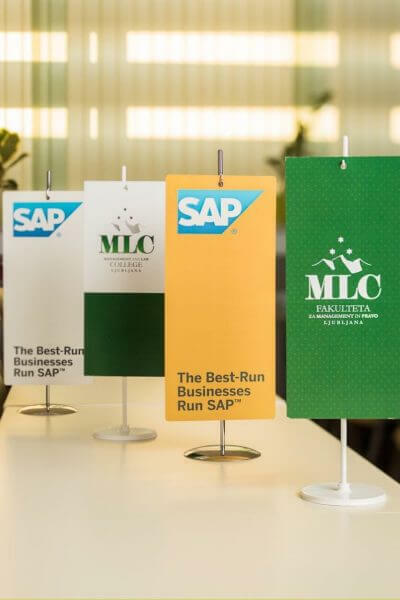 Acquiring one of the MLC certificates: SAP certificate, VD certificate and other certificates conducted by MLC Ljubljana within seminars or elective courses. Free use of the SAP ERP program for study and research purposes. Free use of Verlag Dashofer’s portals. Free use of BISNODE portals for study and research purposes. Free membership in the MLC Ljubljana Library and the National and University Library (NUK). Use of internal study materials in e-form and other MLC library materials. Up to two one-day study excursions at home or abroad per year. Individual and group counseling before and during study. All additional exams and certificates. In accordance with Article 42 of the Value Added Tax Act (Official Gazette of the Republic of Slovenia, No. 13/2011 and others), the prices are exempted from VAT. The price list is valid from 4. 4. 2017 onwards. Are you interested in what the enrollment conditions are?